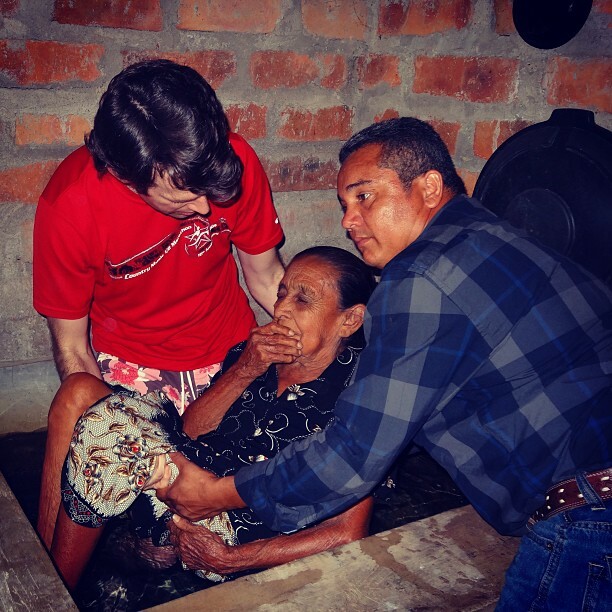 Baptizing Juana Albertine Armas into Christ using a Pila (wash basin), because she has no use of her legs. Today was a great day in Namasigue. We started with a fantastic worship service, and then I had an opportunity to study with Juana as she waited for the medical brigade. In the afternoon we visited with a number of members of the local church to deliver food and offer encouragement. We also had the opportunity to study with a couple that has recently been visiting. Please keep praying for our group and this wonderful community. Home » Blog » Faith » Baptizing Juana Albertine Armas into Christ using a Pila (wash basin), because she has no use of her legs. Today was a great day in Namasigue. We started with a fantastic worship service, and then I had an opportunity to study with Juana as she waited for the medical brigade. In the afternoon we visited with a number of members of the local church to deliver food and offer encouragement. We also had the opportunity to study with a couple that has recently been visiting. Please keep praying for our group and this wonderful community.